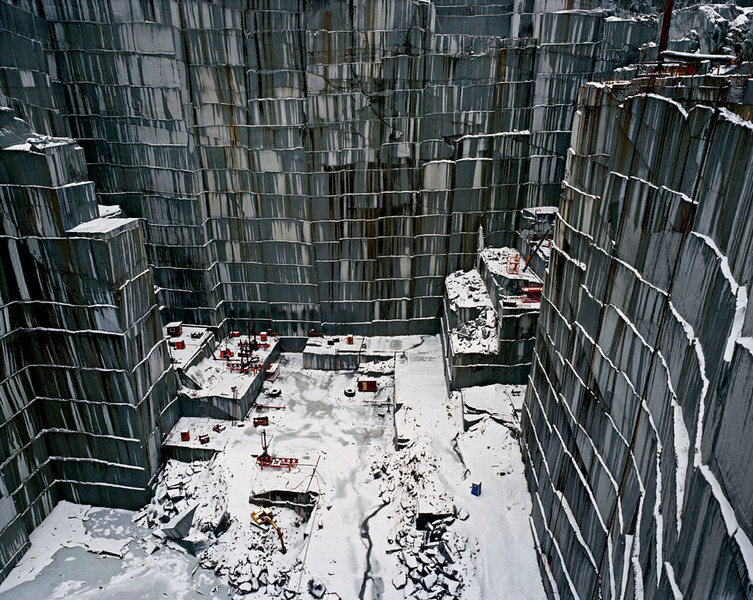 I’ve been a fan of Edward Burtynsky’s work for some time now, and did a post about his work a little while back. Burtynsky was shortlisted for the Prix Pictet in 2009 and after coming across his work on there recently I think another post is in order. The concept of the landscape as architecture has become, for me, an act of imagination. I remember looking at buildings made of stone, and thinking, there has to be an interesting landscape somewhere out there, because these stones had to have been taken out of the quarry one block at a time. 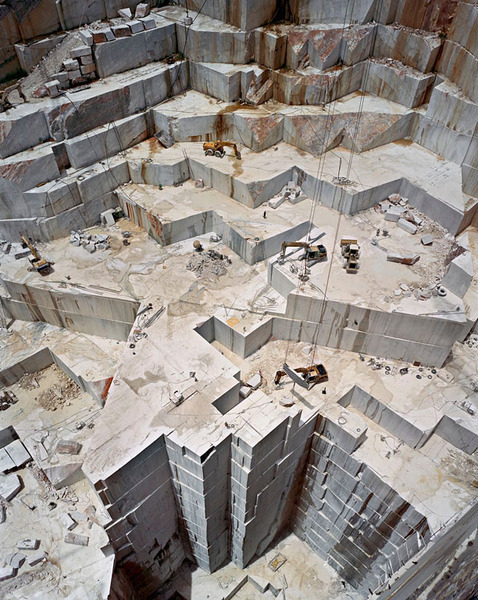 I had never seen a dimensional quarry, but I envisioned an inverted cubed architecture on the side of a hill. I went in search of it, and when I had it on my ground glass I knew that I had arrived. It's an organic architecture created by our pursuit of raw materials. Open-pit mines, funnelling down, were to me like inverted pyramids. 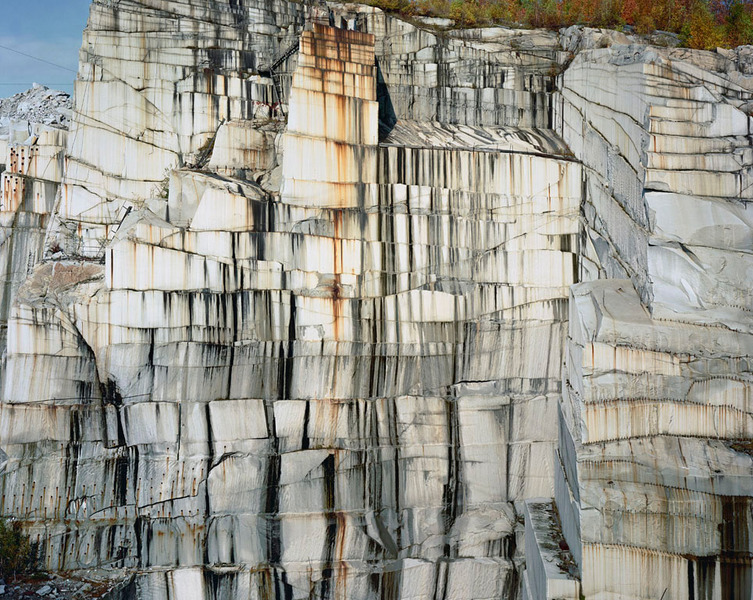 Photographing quarries was a deliberate act of going out to try to find something in the world that would match the kinds of forms that were in my imagination but unseen in real life — the idea of inverted skyscrapers. The ecosystems we depend on appear to face resource demands already beyond their capacity. As governments try urgently to stimulate growth, a central question remains. Can the earth’s complex living systems sustain the future consumption patterns of another three billion people in the world’s population by 2050? Or are we making the transition, as the Nobel laureate Paul Crutzen has suggested, to a point where the face of the earth – its soil, its waters, its groves, its hollows – is no longer natural, but bears the terminal scars of man’s intervention.